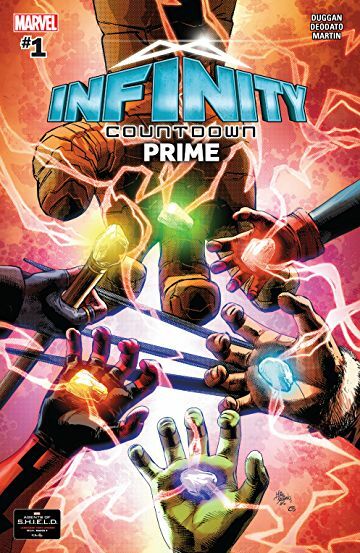 I picked this issue up with some hesitation, because Infinity Countdown Prime looked like an overpriced advertisement for the upcoming Event series. And you get a little bit of that vibe, but happily the issue actually serves as a sequel (or a setup) for the series, tackling the weighty issue answering the question: where are all those Infinity Stones, anyway? The cosmically powerful stones, of course, are at the heart of the upcoming Avengers movie. They last appeared in the Marvel Universe just before the Secret Wars series - and they were apparently destroyed. But with the rebirth of reality at the end of that event, the Infinity Stones were also reborn - and you'll be surprised to see who's holding them now. It's a powerful story (with lots of surprises) by Gerry Duggan, with amazing, vivid and striking art by Mike Deodato, Jr., and color art by Frank Martin. The series is off to an explosive start, and holds lots of promise. And hey, Adam Warlock is back - it's worth buying just for that!